Hello to everyone! Friday is here and I'm so happy! It's been a long week and I am happy my day off is finally here...I'm ready to celebrate! 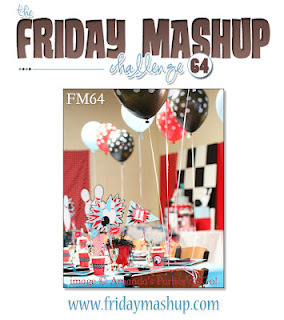 Celebration is the theme that Amanda brings us this week at the Friday Mashup. She wants us to make a box in the bag, a project with a party theme or mash it up and create a box in a bag with a party theme. Don't know how to do a box in a bag? 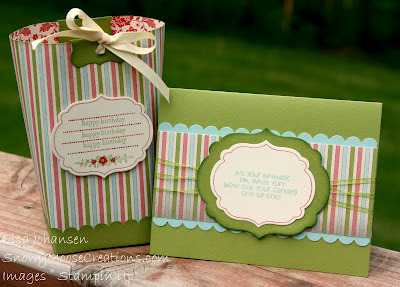 Amanda has a great tutorial on her blog HERE. I decided to go with a birthday theme and used the retired Everyday Enchantment DSP. I just thought it totally rocked the party theme! I used the Framelit Labels to decorate both the front of the bag and the card. Make sure you head over to The Friday Mashup to check out all the other great projects from the DT and then play along with us, I'd love to see all my crafty friends joining in! Make a project using the " Party Time " theme. Or Make a project using the " Box in a Bag " tutorial. Or "Mash it Up" and create a "Box in a Bag with a Party Time theme." I l.o.v.e. that DSP! I really like how you've used the framelits. Super cute! Great combination of papers and framelits - two of my all time fave products! I love the colors in your projects.. The bag is so cute with the flowers on the inside. I love your projects Lisa! I really like your color combo and how you've used the framelits. Beautiful card and matching bag! Great combination of colors, papers, and accents. I just love it!